Since I first came to Wesleyan, I’ve made half-price Wednesdays at Osaka part of my weekly ritual. With a limited budget and a busy schedule, I set aside my apprehensions about discount sushi while satisfying my ceaseless craving for rice and raw fish. But last week my plans were unexpectedly foiled. After making the trip down to Main Street, my friend and I were surprised to find the restaurant dark and empty. The bold-faced “CLOSED” sign affixed to the door dominated my field of vision; the official stamp of death on my routine. The mysterious and dire situation called for some quick thinking, and I soon recalled a conversation I’d had with a classmate of mine a few days prior. A sharp right off Main Street onto Washington Street brought us to Mikado, and our grumbling bellies led us down a flight of stairs into the main dining area. The soft lighting and fish tanks made for a Zen atmosphere, and I stole curious glances at the plates of seated diners as the hostess showed us the way to a free table. Wooden boats held glistening slices of fish laid carefully on top of sticky white rice, and ornamental plants propped up by wasabi shaded the thoughtfully assembled delicacies. I caught myself salivating in anticipation. After taking my seat, I thumbed through the pages of the menu and tried to narrow down the choices. I figured I’d do my best to keep the weekly tradition alive by opting for the Sushi Deluxe, which includes 10 pieces of sushi and a chef’s special roll with whitefish. When I informed the waitress of my shellfish allergy, she assured me that the chef would make the substitutions necessary to accommodate my dietary restriction. As eager as I was to have a new sushi experience, I must admit that it pained me to order from a full-priced menu rather than Osaka’s half-price special. But quality rarely comes cheaply, and my meal did not disappoint. My dish arrived promptly, and my waitress reassured me that the chef had taken care to leave any shellfish off the plate. I then took a moment to admire the attention to detail in the sushi’s presentation: five thin cucumber slices divided the plate, making it easy to discern each type of fish from the next. 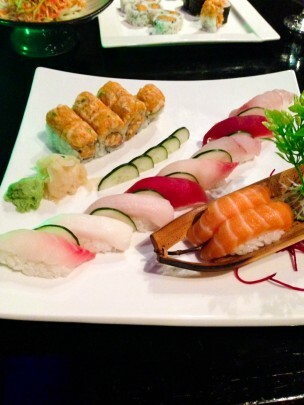 Neatly arranged in two short rows, the special whitefish roll lounged in the corner of the large white plate, while the raw fish over rice took center stage. The cucumber motif continued with a small wedge nestled in between each successive piece of sushi. Arrayed diagonally across the middle of the dish, the sushi produced a wave of color with the pallid fluke fading into the dark pink tuna. In the bitter New England cold, I was suddenly transported to a warm Japanese beach. I followed up my visual appreciation with indulgence, diving into the simple, clean taste of the sushi. The cool, slippery fish swam across my taste buds, accompanied by a smear of wasabi and a thin glaze of soy sauce. The wasabi added a bit of spice while the soy sauce gave the fish just the right touch of brininess. After wading in an ocean of flavor, I felt refreshed and satisfied. Despite the higher price tag, Mikado was a stellar backup plan. From the atmosphere, to the service, to the food, the gustatory adventure was a fantastic way of changing up my typical Main Street dining habits. Once I had plunged into the Mikado experience, I didn’t want the swim to end.